Kaleidoscope can often be seen performing music at regimental dinners within the JNCO’s, WO’s & SNCO’s Messes & Officer’s Wardrooms around the south of England. 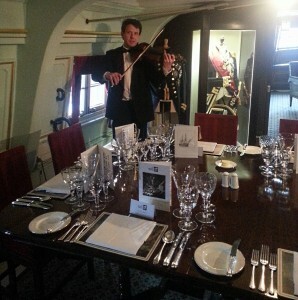 With the emphasis on ‘background music’ our string quartet and palm court trio remain a popular choice for today’s mess functions. In addition to providing suitable music during the dinner, we also have our own extensive library of music containing most of the world’s National Anthems along with many regimental marches. As with any military event, good time keeping, smartness and reliability will be high on the list of priorities. In addition to providing musical support to many Army, Navy and RAF establishments, we’re often engaged to provide music for the Worshipful Companies, Freemason Lodges and other important organisations based in London. Regular venues include Stationers Hall, The Tower of London, Banqueting House, The Guildhall and Trinity House, usually performing as a salon orchestra. Our prices are competitive and we look to offer discount on mid-week bookings where possible.